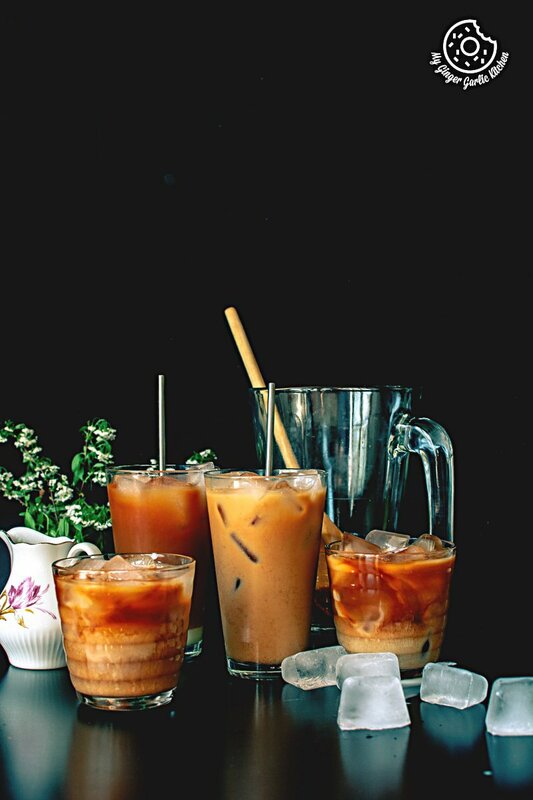 Learn to make Thai Iced Tea Recipe with a quick video tutorial. Thai Iced Tea is a concentrated spice infused, and flavorsome tea which comes with a creamy texture and sweet aromatic taste. 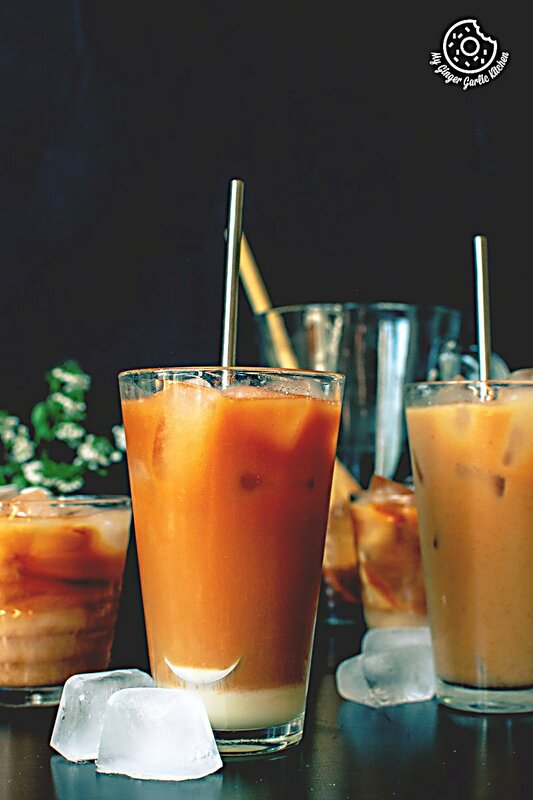 Thai tea is poured over ice cubes and then drizzled with some sweetened condensed milk. Anyone who loves tea, or creamy sweet drinks, would love this refreshing drink. 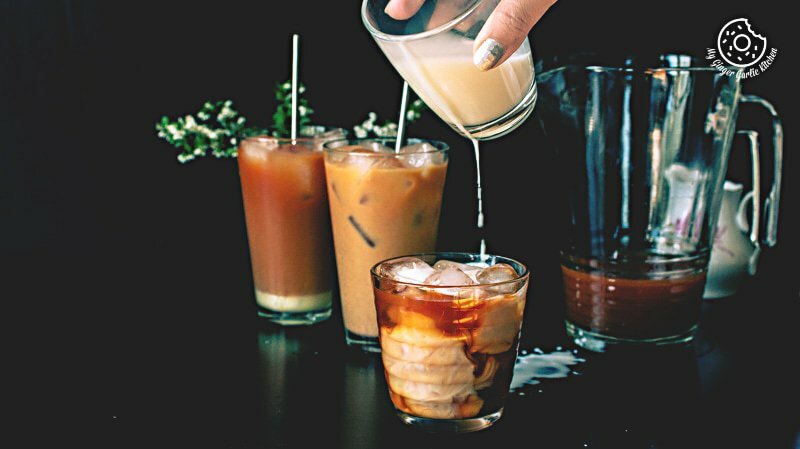 Is it easy to make the vegan version of this Thai iced tea? Yes, it is unconditionally an easy job. All you have to do is to swap sweetened condensed milk for coconut condensed milk. Rest of the recipe will remain the same. You can also try this vegan version even if you are not vegan yourself because it tastes incredibly different and delish with the touch of coconut. When and where did I first savor my Thai Iced Tea? I had my first Thai iced tea at a local renowned Thai restaurant when one day I visited it with a couple of friends. We all were looking for something different and new to try and then we went for this Thai Iced Tea along with Thai food. This tea was double sweetened with sugar and sweetened condensed milk. A spice and dessert lover in me went crazy right after the first sip I took then. It was the ‘love at first sip’. How does Thai iced tea taste? It tastes like a dessert in the form of liquid. It is sugary and has a piquant spicy aftertaste. Any spice and dessert lover would adore this drink. This spicy dessert glass surely helps soothe the burn coming after the overloading the spicy Thai food or any other spicy meal. 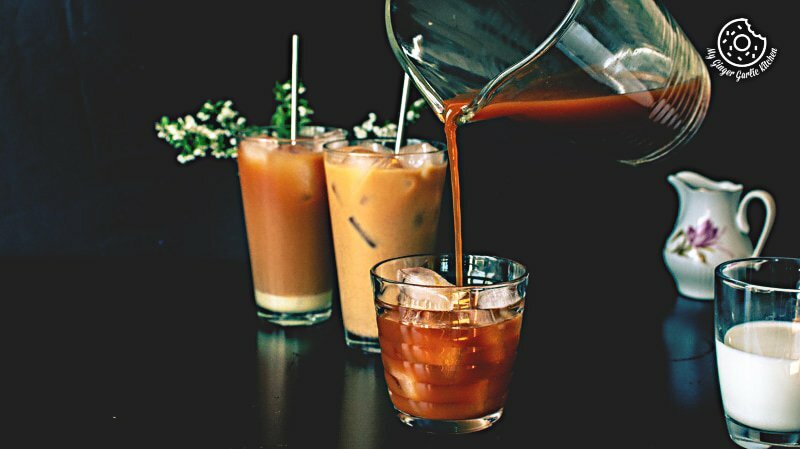 How easy is it to make Thai Iced tea? Making your own Thai iced tea at home is unexpectedly easy. You can make it anytime without much hassle. You simply steep the tea, strain and pour over ice cubes. Why this Thai Iced Tea or ‘Cha Yen’ is so popular? Thailand is well known for a number of famous beverages worldwide. But this drink ‘Cha Yen’ which is the literal translation of the Thai Iced Tea, tops all. Thai iced tea is served at restaurants globally and loved by everyone. I assume that the creamy dessert like sweetness makes this refreshing beverage dreamy and desirable everywhere. The exclusive creamy character and sweetness from condensed milk are so diverse from any normal cup of black tea. Definitely, this iced tea is so loved. Is it easy to get Thai tea (leaves) everywhere? You can get Thai tea at an Asian grocery store. But I also agree that getting the Thai tea bags everywhere is not so easy. But Thai Iced Tea lovers found a solution to recreate this tea at home. To get perfect Thai tea blend, you’ll only need some loose black tea leaves and then you add a few spices to it while boiling. What is the difference between Thai iced tea and Black tea? Regular black tea is mild — not creamy and not too sweet. Thai iced tea is a divine treat which has the creamy texture and a flavourful sweet taste. The other major difference between Thai tea and black tea is that Thai tea has that signature orange color. Whereas, when you use black tea you won’t get that significant orange color you get in Thai Iced Tea. Why is Thai Iced Tea orange in color? If you have ever been to Thailand and had Thai iced tea on the streets, then you know that the tea is always orange in color. Like you, I have also always wondered why this tea has so intense orange color. The reason is that the mix of Thai tea includes some yellow food color. Is it necessary to add evaporated milk to Thai Iced Tea? No, it’s not. Some people like to add evaporated milk along with sweetened condensed milk. Evaporated milk is like an unsweetened heavy cream. So the addition of evaporated milk makes this Thai iced tea super creamy and milky. I don’t like Thai iced tea overly creamy, so I don’t add evaporated milk. But if you like your tea super creamy and milky, then surely add evaporated milk. What is the right way to steep? You can steep this tea in a teapot, in a pan, or you can simply use a tea sock for steeping. The one thing which is important to remember is to always use hot water if you are not boiling it in a pan. You just leave tea leaves in hot water, steep for a few minutes until you see that deep color. Let it cool and strain the tea leaves out. Can I use black tea bags instead of loose tea leaves? Yes, definitely you can use black tea bags. Replace 1 tbsp tea leaves with 3 tea bags. You can even make it caffeine free. Is this tea prepared hot or cold? Thai iced tea is usually prepared hot and yet it’s polished off cold on the crushed ice. The hot tea is poured over a cup filled with ice cubes or crushed ice. You can either use hot tea or let it cool before serving the way I did. 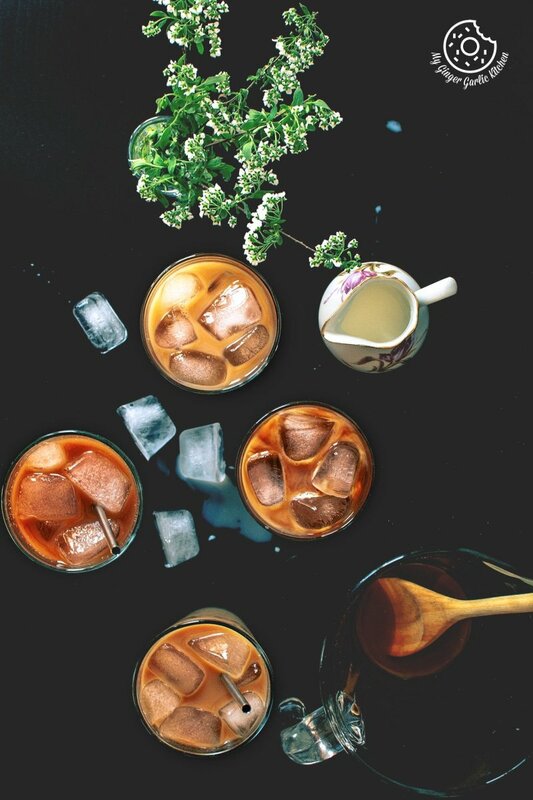 What is there to love about Thai Iced tea? This iced tea is so refreshing on a hot day. 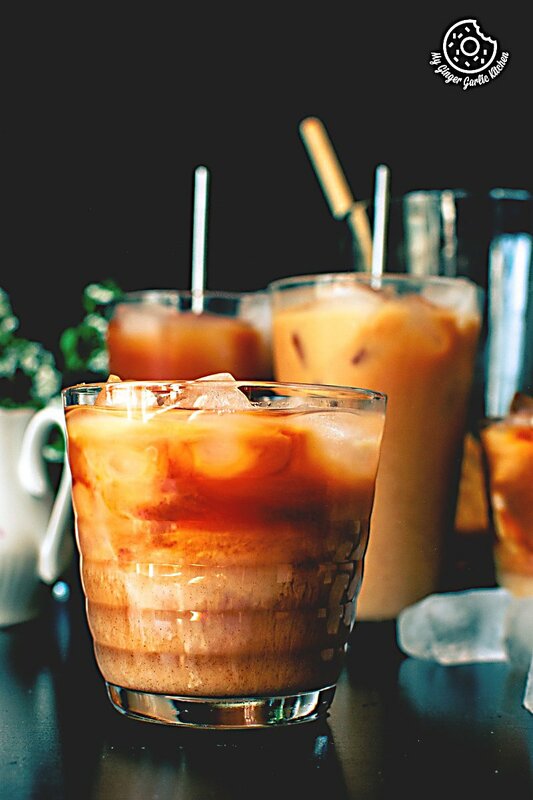 I can basically sip this delicious drink called Thai iced tea all summer long. Spices such as star anise, cinnamon, cloves, and cardamom add warm spicy aroma to the iced tea. Thai Iced Tea is a concentrated spice infused, and flavorsome tea which comes with a creamy texture and sweet aromatic taste. 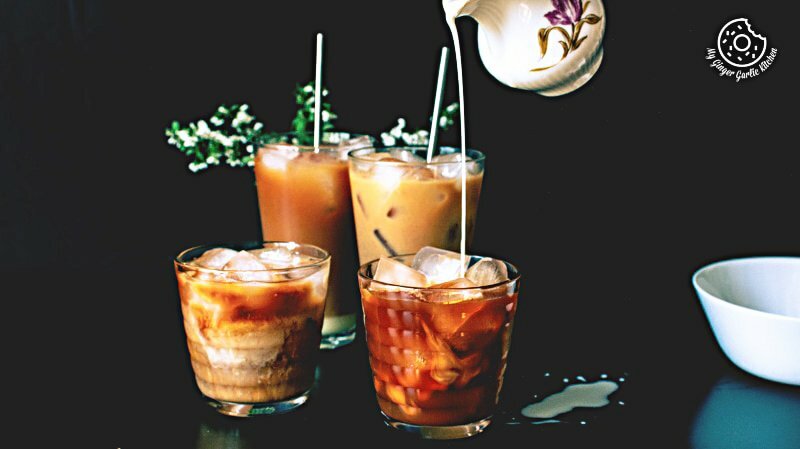 Thai tea is poured over ice cubes and then drizzled with some sweetened condensed milk. Anyone who loves tea, or creamy sweet drinks, would love this refreshing drink. 1. Add water to a medium saucepan. Add tea leaves, sugar, star anise, cinnamon stick, cloves, and green cardamom. 2. Stir well and bring the water to a boil. 3. Boil over medium heat for 3-4 minutes. 4. Turn off the heat and cover with the lid. 5. Allow tea to steep for at least 30 minutes and let it cool to room temperature. 6. Once cooled strain tea in a pitcher. 7. You can make this tea ahead of time a refrigerate in the fridge for up to 1 week. 1. Fill tall glasses with crushed ice or ice cubes. 2. Pour in Thai tea leaving enough room or till each glass 3/4 of the way full with tea. 3. Drizzle with one tablespoon of sweetened condensed milk to each glass, and stir well to combine. You can store it in the refrigerator for up to 1 week.